AUSTRALIAN Rowing Team member and London 2012 Olympic silver medal-winning athlete Kate Hornsey has announced her retirement from rowing. The 33-year-old Hornsey, who grew up at Molesworth, competed most recently in the Australian Women’s Eight that raced at the 2014 World Rowing Championships but has made the decision to retire from the sport. “I have been a part of the senior Australian Rowing Team for a decade and the sport will always be one that I care very deeply for but sadly the time has come for me to retire," Kate said on Friday. “It became a decision for me as to whether I wanted to continue rowing and push for a place in Rio or whether to look to my future beyond rowing. The decision was by no means an easy one but I feel it is the right one for me and my family." Hornsey won numerous accolades in her time with the Australian Rowing Team, including two gold medals in the 2005 World Rowing Championships, in the Women’s Coxless Four and the Women’s Eight, a time she describes as still one of her most treasured moments. “I would have to say winning gold in the eight and the four at the 2005 World Rowing Championships was one of my career highlights." Hornsey said she'd had the time of her life at the 2005 championships and to follow that up with a silver medal in London in 2012 had been something else. “The 2012 season had been a challenging one, but also a highly rewarding one. 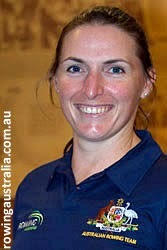 It was a great season ... and is easily my greatest highlight along with the 2005 World Rowing Championships,” she said. Hornsey represented Australia in two Olympic Games - Beijing in 2008 and London in 2012. She originally rowed out of New Norfolk Rowing Club, where she is now a life member, as well as the Friends’ School Boat Club and Mercantile Rowing Club in Melbourne. She offered her gratitude to a number of people for her rowing success, including her family, friends and coaches Cliff Hutton, the late Roger Drummond and Bill Tait who coached her to an Olympic medal. Rowing Australia high performance director Chris O’Brien said Kate had represented Australia with distinction and her presence on the team would be missed by coaches and team-mates alike. Congratulations to Kate on an outstanding career.